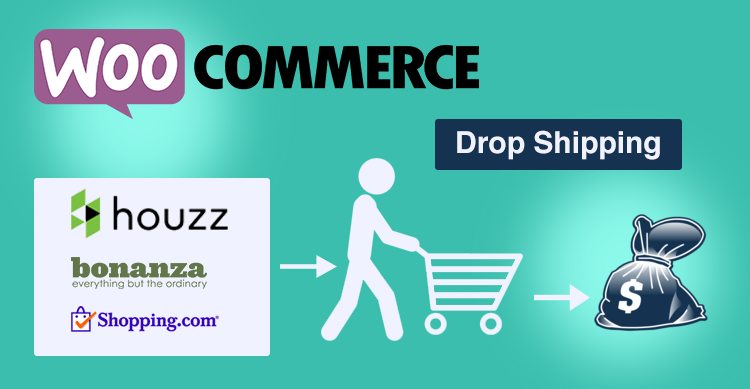 Top WooCommerce Dropshipping Sales Channels You Need TODAY! Imagine having a “one-size-fits-all solution” to running an eCommerce site; regardless of your technical knowledge. WooCommerce is that solution. WooCommerce, a platform built to seamlessly integrate with WordPress, is a free eCommerce plugin that allows you to sell physical and digital products of any size. The reason behind WooCommerce’s success is apparent with over 30% of all online stores powered by this plugin. You can offer shipping with WooCommerce wherever your business model allows, integrate extensive payment options, customize the look and design of your store and the best part – you OWN all of it FOREVER! The reason behind WooCommerce’s success is apparent with over 30% of all online stores powered by this plugin. You can ship wherever you want, integrate extensive payment options, customize the look and design of your store and the best part – you OWN all of it FOREVER! What benefits do I get from using WooCommerce for Dropshipping? The main benefit of using WooCommerce for Dropshipping is the endless possibilities that come with ANY plugin that is supported by WooCommerce. Why do I need the best WooCommerce Dropshipping Sales Channels? Haphazardly choosing every sales channel that you come across won’t work either. The dropshipping sales channels that you choose must be unique to its segment or with a large number of loyal visitors for the products you are offering. What are the Top WooCommerce Dropshipping Sales Channels? Based on the products that you’re dropshipping, a particular sales channel might be more effective than the other. However, you can still receive high traffic by targeting a niche market of multiple sales channels. Almost every individual with access to the internet knows what eBay is and what it does. eBay is the world’s largest online platform to sell goods and is even regarded a household name at this point. You can reach customers around the globe by dropshipping with eBay. One of the major factors behind eBay’s success is its auction feature that allows sellers to choose between selling products for a fixed price OR in an auction. If you’re dropshipping a rare item, put it up for auction, because at the end of the day, an item is only worth what a buyer is willing to pay for it. Some dropshippers use their own site as a sales channel but end up frustrated with poor Google ranking. It takes months if not years for your site to get a decent Google ranking, let alone reaching the top. eBay has the best Search Engine Optimization so you don’t have to worry about marketing or paying for traffic. eBay offers up to 20% discount on shipping for its sellers. Any amount of discount on shipping is every dropshipper’s dream and eBay makes it come true. The online market is over-saturated with new and upcoming online stores. But there are only a handful of brands that people trust without a second thought, and eBay is one of them. Since its establishment in 1995, it has massively gained the trust of buyers worldwide. There is a reason why Amazon went from only selling books in 1995 to establishing itself as an online selling giant in today’s world, and it isn’t luck. Over 2 million sellers prefer Amazon because they report having almost 50% more sales from the site than any other sales channel. Amazon maintains an inventory of its sellers at a minimal annual fee. You don’t have to worry about your products collecting dust in your basement. Another plus point is you can expand your inventory as your business expands by paying Amazon much lesser than what you would if you were to do it physically. Amazon is one of the highest visited online portals on the web. During the first quarter of 2016, the company stated to have reached 285 million active users! This along with the benefit of SEO sets Amazon as a top WooCommerce dropshipping sales channel. FBA makes your products visible to worldwide Amazon customers while providing fast shipping. As their slogan suggests, Amazon picks, packs and ships your orders to its customers. You only need to send your inventory to Amazon’s fulfillment centers located around the world. Your products are stored securely and automatically become eligible for AmazonPrime and free super saver shipping. It’s a win-win for your customers because they get free shipping and for you, it’s basically free marketing. The average margin online is at a 50% markup whereas Amazon’s referral fees are below 20%. It allows you to make profits from an already low listing price. There are hundreds of comparison shopping sites but Google is the one that is in a league of its own.The best thing about comparison shopping engines like Google Shopping is that it only displays thy product you have put up for sale so the customer has to be redirected to your dropshipping site to place an order. Bonanza is the best dropshipping sales channel for those targeting the fashion industry. It has over 25,000 registered businesses and is a great option if you’re planning to dropship to fashion niche customers. One of the main reasons that make its users love Bonanza is ZERO listing fee! You only have to pay 3.5% closing fee on sales under $500. Shopping.com is a price comparison service owned by eBay and operates in USA, UK, France, Germany and Australia. It accepts CPC bidding, where merchants must pay a minimum of $100. Since eBay and Shopping.com’s functionalities are getting merged, you should not miss out on dropshipping on this site. If you’re searching for the perfect platform for architecture, interior design and decorating, Houzz is the perfect dropshipping channel. It collects 15% commission from sellers on transactions and also offers premium subscription service for home professionals. In a study done in 2015, it was found that nearly two-thirds of Houzz users in the U.S. completed a remodeling or redecorating project. There are hundreds more to choose from since a WooCommerce is the biggest platform for dropshippers. However, dropshipping manually across all of these platforms isn’t an easy task. How is it possible to dropship to all of these platforms simultaneously? You’re in luck because there is a single solution that lets you drop ship to all of these WooCommerce Dropshipping Channels in an efficient way with the help of ExportFeed. ExportFeed is a feed management solution that works on WordPress alongside WooCommerce platform. It lets you automatically create product feed across 40 of the biggest merchants online. Addressing the big question, yes, ExportFeed lets you dropship across multiple WooCommerce platforms. Imagine not having to worry about manually updating each and every dropshipping sales channel every time there is a change in your inventory. You can leave that hassle to ExportFeed, which automatically syncs different dropshipping channels’ feed with a single click! Depending on the volume of items you’re dropshipping, it might take weeks to create a customized feed for every WooCommerce Dropshipping Sales channel. Since ExportFeed does it all for you, you will save time which can be utilized to grow your business. ExportFeed provides all of its clients’ end-to-end support with a group of the dedicated support team on standby to help you solve any and all problems regarding product feed management. A majority of dropshippers skip certain dropshipping sales channels simply because the sites keep pointing out a number of errors. By using ExportFeed, you can sit back and let the plugin take care of optimizing product feeds without a single error. And even if they do arise, the support team comes to your rescue! What’s keeping you from trying out ExportFeed and seeing for yourself why it is the best product feed solution? Try a 7 day FREE TRIAL without any feature restrictions and watch your business take off at full speed!